Samir was a religious person and served in his church. Unfortunately, his church was randomly and illegally shut down by the state for some time. Later, he and his family and neighbors survived a terror attack upon the villagers but their loved ones did not. For this reason the state provided them with a special security clearance for bus attack “victims” and reopened the church. This scenario is a typical one. The state fabricates a reason to shut down a church that is central to the welfare of the village. Worship and clergy are important and especially critical when dealing with constant violence. Because jihadists flourish and the state is lax in protecting minorities terror incidents are prevalent. 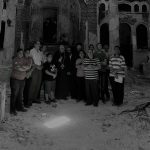 This time, thanks to the impulse of the government, Samir’s church was allowed to reopen temporarily and be used to mourn the dead. After attending a celebration mass in memory of one child and six adults lost in the gunfire, Samir searched his soul. He came to a decision that required a lot of courage. He decided to leave the country alone in order to create a future for himself and eventually help his family. At eighteen years old, Samir took a tremendous risk in order to do this. He felt it was his only hope. Samir now needs our help. The La Casa Futura project will transition him and others like him from the refugee camps into a new culture. La Casa Futura is the only concrete provision for young Egyptians willing to assimilate — learn a new language, train for a job and understand a new culture. Please donate today at the GoFundMe link below. Help us help Samir and so many others like him. Your contribution will go to the La Casa Futura program to provide programming for young Egyptians who seek the chance to begin again in the West.